Regardless of the method used for state projections, only the state win probabilities are needed to calculate the expected electoral vote. A simulation or meta-analysis is required to calculate the electoral vote win probability. 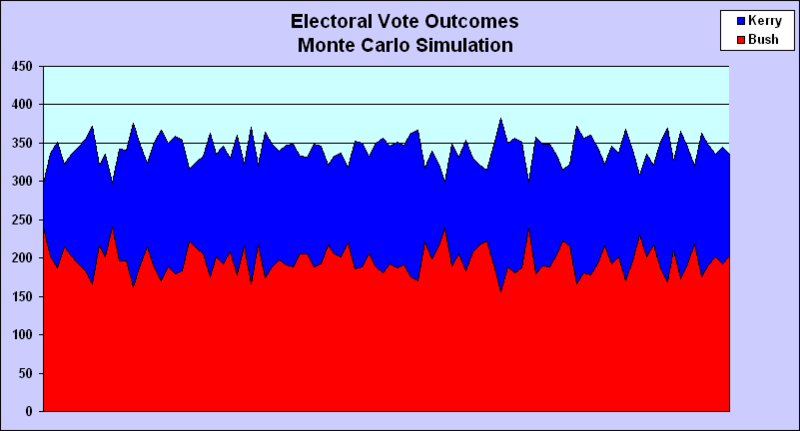 The most efficient method for projecting the electoral vote win probability is Monte Carlo simulation. This technique is widely used in many diverse applications when an analytical solution is prohibitive. It is the perfect tool for calculating the EV win probability. The 2012 Presidential True Vote and Election Fraud Simulation Model snapshot forecast exactly matched Obama’s 332 Electoral Votes. The model also forecast a 320.7 theoretical (expected) EV and a 320 simulation (mean) EV. In the 2008 Election Model, Obama’s 365.3 expected theoretical electoral vote was a near-perfect match to his 365 recorded EV. His 365.8 simulation mean EV converged to the theoretical and his snapshot EV was 367. The projected 53.1% share was a close match to the 52.9% recorded share. His 100% win probability was based on 5000 election trials. But the Election Model utilized pre-election Likely Voter (LV) polls which understated Obama’s True Vote. The National Registered Voter (RV) polls projected 57% which was confirmed by the a) True Vote Model (58%,420 EV), b) unadjusted state exit poll aggregate (58%,420 EV) and c) unadjusted National Exit Poll (61%). What does this prove? That no more than 500 simulation trials are required to approach the theoretical forecast recorded EV. The simulation is based strictly on state win probabilities. The only reason a simulation is required is to calculate the electoral vote win probability (the percentage of winning election trials that exceed 269 EV). A simulation is not required to forecast the EV. It is merely the product sum of the state win probabilities and electoral votes. Election blogs, media pundits and academics develop models for forecasting the recorded vote but do not apply basic probability, statistics and simulation concepts in their overly simplistic or complex models. They never mention the systemic election fraud factor. But it is a fact: the recorded vote differs from the True Vote in every election. In each of the 1988-2008 elections, the unadjusted state and national presidential exit polls have differed from the recorded vote. 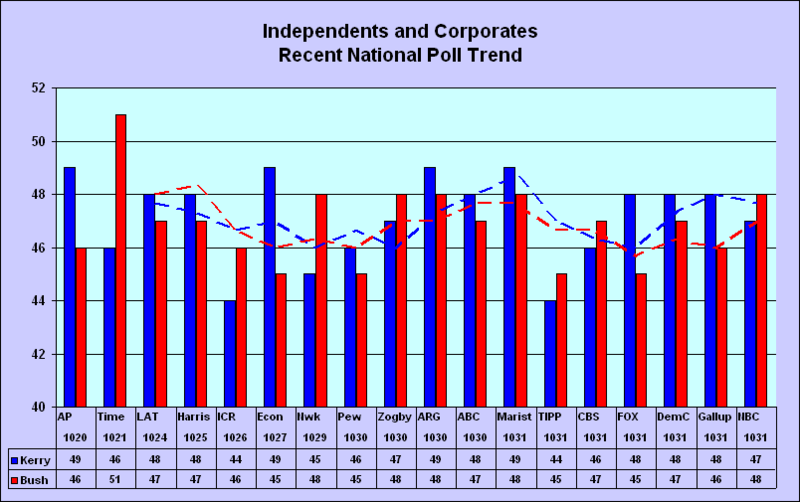 The Democrats won the unadjusted poll average by 52-42% compared to the 48-46% recorded margin. The exit polls confirmed the 1988-2008 True Vote Model in every election. 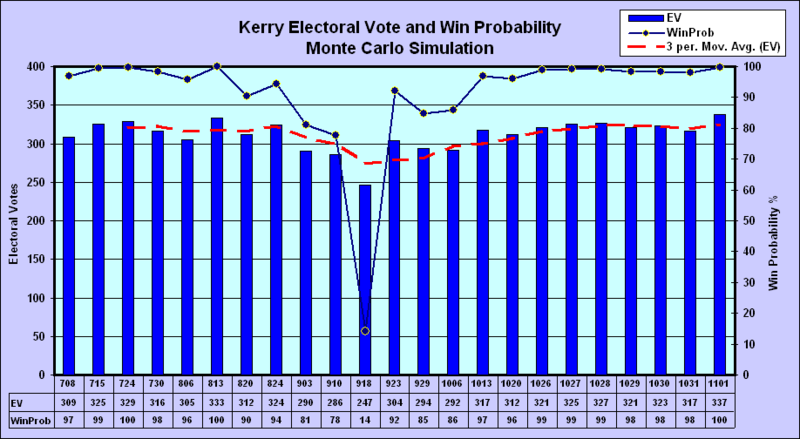 The 2004 Monte Carlo Election Simulation Model calculates 200 election trials using final state pre-election polls and post-election exit polls. 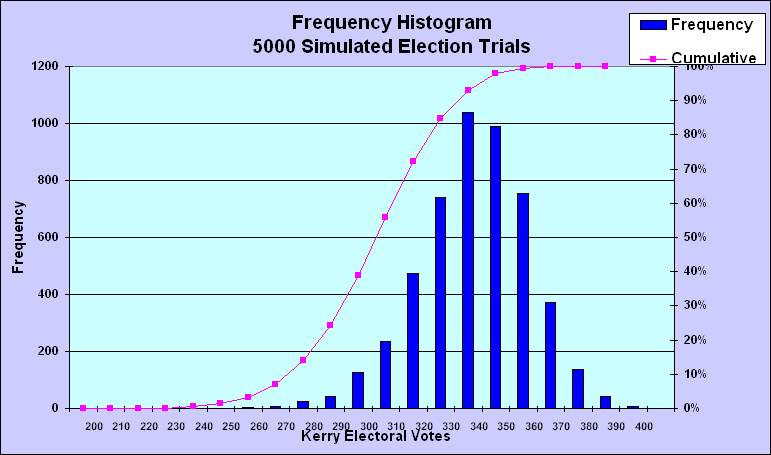 The 2004 Election Model used a 5000 election trial simulation. The win probability is the percentage of winning election trials. The average electoral vote will approach the theoretical value (the EV summation formula) as the number of trials increase: the Law of Large Numbers (LLN) applies. The average and median EV’s are very close to the theoretical mean; no more than 5000 election trials are required to accurately derive the EV win probability. The model projected that Kerry would have 337 electoral votes with a 99% win probability and a 51.8% two-party vote share. I allocated 75% of the undecided vote to Kerry. Exit pollsters Edison-Mitofsky, in their Jan. 2005 Election Evaluation Report, showed an average within precinct discrepancy of 6.5%. This meant that Kerry had 51.5% and 337 electoral votes, exactly matching the Election Model. The unadjusted state exit poll aggregate (76,000 respondents) on the Roper UConn archive website had Kerry winning by 51.0-47.5%. The unadjusted National Exit Poll (13,660 respondents) shows that he won by 51.7-47.0%. 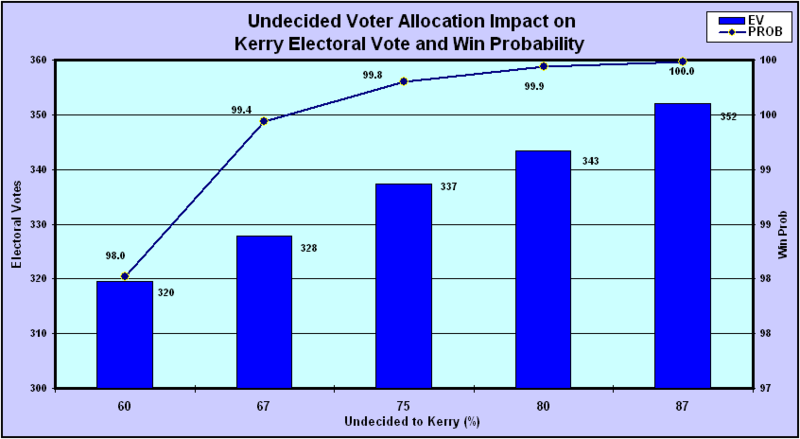 Kerry had 53.5% in the post-election True Vote Model – a 67-57 million vote landslide. But it was not enough to overcome the massive fraud which gave Bush his bogus 3.0 million vote “mandate”. The Election Model includes a sensitivity (risk) analysis of five undecided voter (UVA) scenario assumptions. This enables one to view the effects of the UVA factor variable on the expected electoral vote and win probability. Kerry won all scenarios. Electoral vote forecasting models which do not provide a risk factor sensitivity analysis are incomplete. Princeton Professor Wang projected that Kerry would win 311 electoral votes with a 98% win probability, exactly matching pollster John Zogby – and closely matching the exit polls. But Wang was incorrect in his post-mortem to suggest that his forecast was “wrong” because Bush won the late undecided vote. 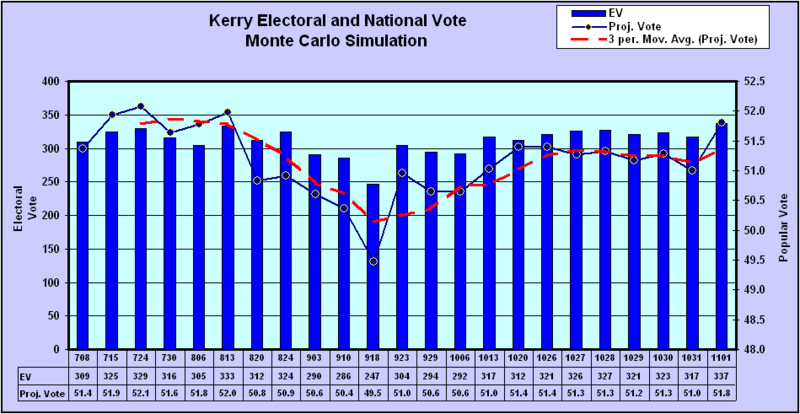 All evidence indicates that Kerry easily won the late undecided vote and the historical recorded indicates challengers win undecideds 80% of the time. Based on historic evidence, the challenger is normally expected to win the majority (60-90%) of the undecideds, depending on incumbent job performance. Bush had a 48% approval rating on Election Day. Gallup allocated 90% of undecided voters to Kerry, pollsters Zogby and Harris: 75-80%. The National Exit Poll indicated that Kerry won late undecided voters by a 12% margin over Bush. Wang never considered that the election was stolen. Then again, neither did AAPOR, the media pundits, pollsters, academics or political scientists. But overwhelming statistical and other documented evidence indicates massive election fraud was required for Bush to win. Meta analysis is an unnecessarily complex method and overkill for calculating the expected Electoral Vote; the EV is calculated by the simple summation formula given below. This is a one-sheet summary of 2004 and 2008 True Vote calculations with many links to relevant posts and data.